Jailbreak Hack Puts 'Chat Heads' on iPhone the Way Facebook Intended - iPhone.MY - Daily News On Mac, iPhone, iPads, iPods and more! The Verge reports on a new jailbreak hack for the iPhone that puts Facebook’s new ‘Chat Heads‘ feature above all other content on the device, similar to how Facebook Home works on Android. On Android, Facebook’s Chat Heads float above all other content so users can quickly jump in and out of conversations while they continue to use their phone for other tasks. 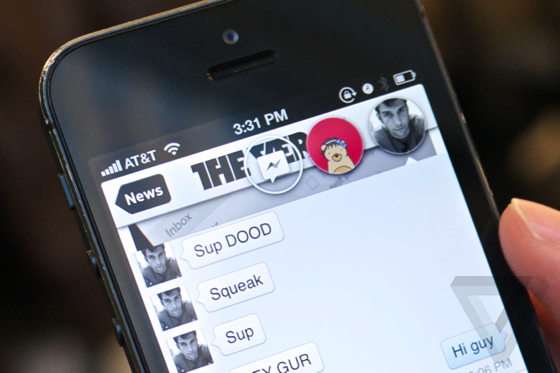 On the iPhone, Chat Heads are normally only active when users are actually using the Facebook app. The hack will be released on jailbreak app store Cydia and Github in the next few days. Facebook executives were asked at a recent conference if they had spoken with Apple about bringing the full Chat Heads experience to the iPhone, but they demurred. Duke Nukem Forever Also Coming To iOS?